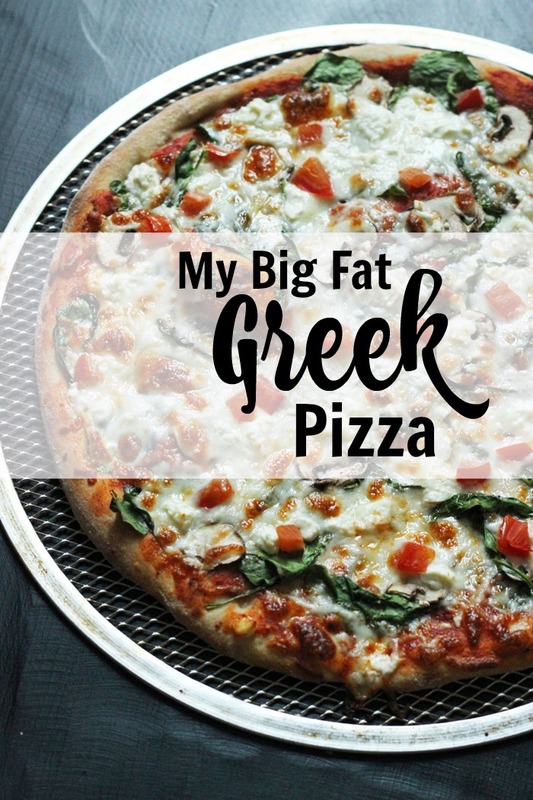 Take pizza night to new heights with my Big Fat Greek Pizza which is full of flavor and just a little out of the ordinary. I think if it weren’t for steak, I could easily become a vegetarian. I almost always choose a meatless item at a restaurant. And my meals at home often drift that way. Especially when it comes to pizza. Often I’m very content just to have mushrooms, sauce, and cheese. But, when I veer from that simple standard, I go in the direction of Greece. 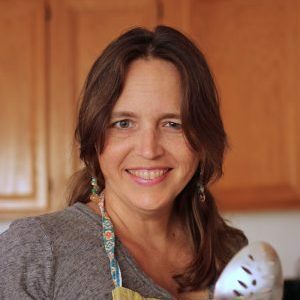 My Big Fat Greek Pizza, redolent with Greek flavors is a fabulous taste treat, one that I’ve made dozens of times — and even convinced some of my children to love as well. What makes this Greek Pizza greek is the spinach and feta cheese. I embellish it with extra vegetables for a little heft. It’s meatless while still being hearty. 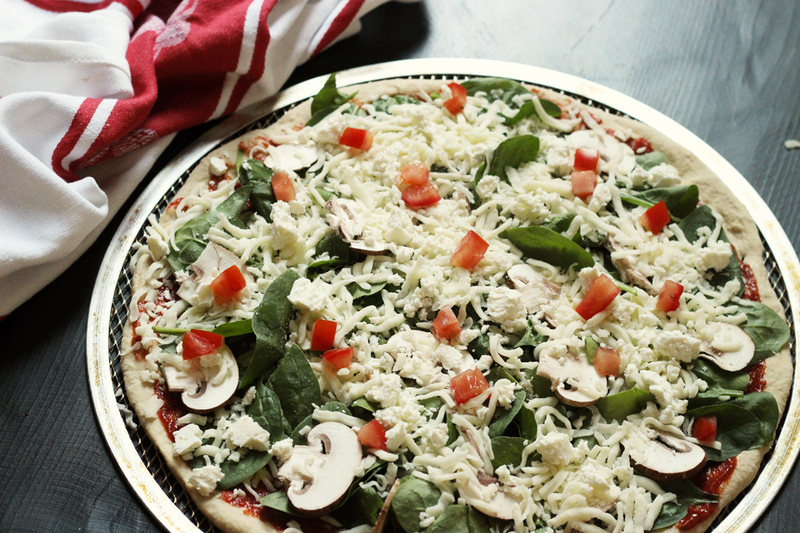 The tang of the cheese and the sweetness of the sauce play well with the woodsy mushrooms and fresh spinach flavor. 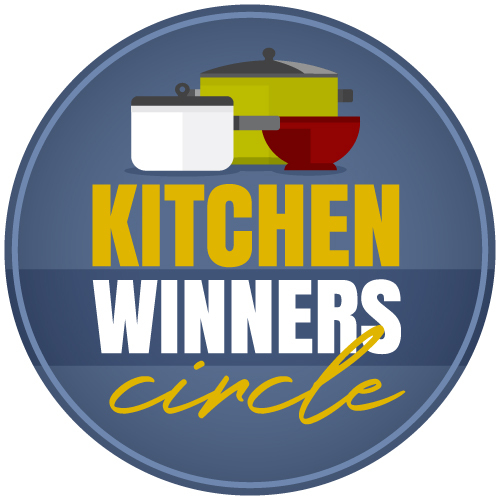 Each Friday, I mix up a double batch of homemade pizza dough. I divide that monster dough ball into six portions. Well, seven actually. I take 1/6 and divide it further as my girls like to have personal pizzas. Then I set to work making a variety of pizzas to suit the tastes of those at our table. Two kids prefer plain pepperoni and cheese. The others are a little more adventurous. The “baby” puts an egg on her personal pizza. The college man usually does chicken and artichoke and spinach — will need to share that one with you soon. The other two will eat anything as long as there’s meat on it. My husband is pretty flexible and will try whatever topping I send his way. I? I take the road less traveled by, either making a plain mushroom pizza or heading toward veggies and flavorful cheese. And once in awhile throwing some bacon, pepperoni, or chicken into the fray. This Greek Pizza is simple and affordable, yet packed with flavor. I think you’ll be pleasantly surprised at how tasty spinach on a pizza is! For the carnivores among you, you could easily add grilled chicken or steak. 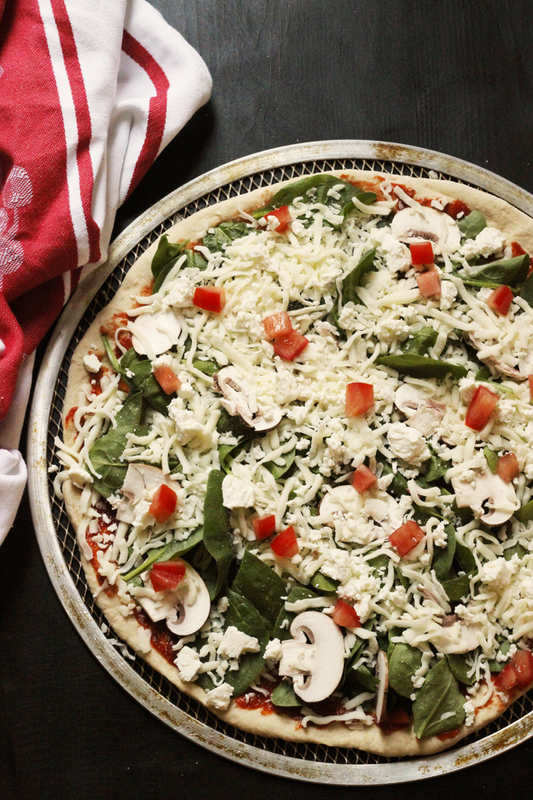 Either way, it’s a fabulous meal and perfect for Meatless Mondays or your next Pizza Night. Preheat the oven to 475 °. Spray a pizza screen with nonstick cooking spray. Flatten the dough into a thin round and place on the prepared screen. Spread the tomato sauce over the crust and sprinkle with basil and garlic powder to taste. Layer the spinach leaves over the sauce. 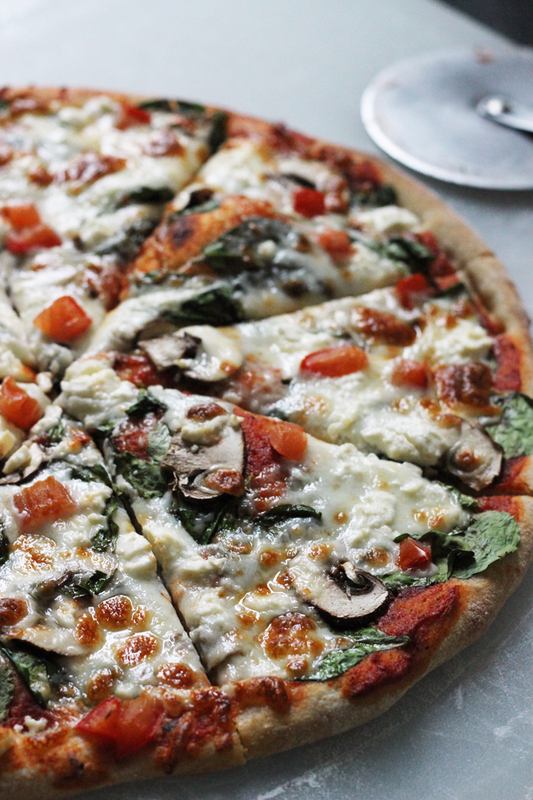 Layer the mushrooms, feta cheese, mozzarella, and tomatoes over the spinach. Originally published December 23, 2012. Updated October 24, 2016. I love pizza, and yours looks and sounds scrumptuous. However, I have never made my own pizza because I would have to purchase several toppings to please everyone and in packaged amounts greater than I would use up in one meal. Then I’d have to figure out how to use the leftovers. When I can usually get a large take-and-bake pizza (to serve 3) for $9, making my own hasn’t seemed economical. Nancy, I had the same problem. Now I prep all the pizza toppings and use them in several consecutive meals. 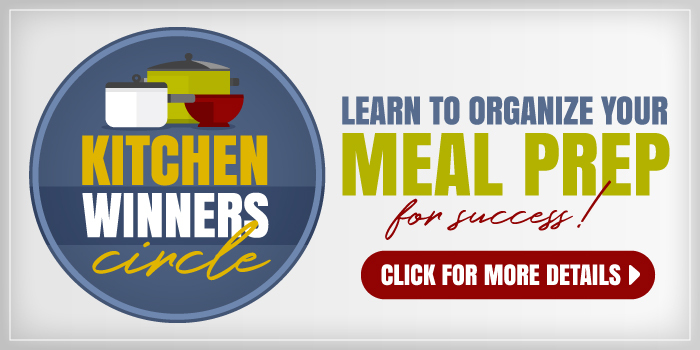 The toppings are used for pizza one night, in salads for salad bar next night, omelets for breakfast or dinner the next day, and with a dip for snacks or appetizers. I like so many pizzas. This one sounds yummy. One I made years ago, that I really should make again, used a can of seasoned diced tomatoes for the ‘sauce’, then had slivers of baked turkey (from Thanksgiving), slices of black olives, and feta cheese on top. Baked until crust was cooked and all was heated through. It was delicious. There’s a good chance I would add spinach to it if I happened to have some, since I think that would be a nice addition. How do you cook all of them? Do you have to do them in batches or can you fit them all at once? I have thought of doing this for our clan of 8, but I didn’t want to have to wait for some, while others were getting cold. @Cindy, that is a challenge. I do them in batches with mine last so that I can eat salad with them all at the table. My little kids don’t care if they eat cold pizza. Hello! I’ve recently came across your website in a search engine and I’d love to make these pizzas, but when I click on the link for the pizza dough, it no longer exists. Help! Thanks for letting me know. There was an issue with the new server. It’s been fixed so the link should work now. Thanks!